Please set all audible beeps to "OFF" for USCF rated games. Due to the recent proliferation & variety of digital chess clocks as well as the USCF preference for digital clocks over analog clocks for rated games combined with a high percentage of players who still do not fully understand the operation & programming functions of their own clocks, this page contains User Manuals in readable & downloadable files of as many digital chess clocks as I can find. At this time I'm sure the list is incomplete, but I've tried to focus first on the most common types of digital clocks in use in USCF rated tournaments today. Note however that some of the references to rules & customs in "how_to_chessclocks.PDF" are incorrect in light of the current USCF rules! Fischer = before a player has made their move, a specified time increment is added to their clock. Time can be accumulated, so if the player moves within the delay period, their remaining time actually increases. For example, if the delay time is five seconds, and a player has four seconds left on their clock, as soon as their opponent moves, they receive the increment and has nine seconds to make a move. If they take two seconds to move, on the start of their next move they have twelve seconds. There is also a variant of this time control that adds the delay after a player makes their move ("Fischer after" or more commonly increment), so the delay is added to the player's remaining time and is available for their next move. If however time runs out during their move, the game ends without the delay time being added. This variant prevents the player who is in time-trouble to take advantage of the extra-time. Bronstein delay = with the Bronstein timing method, the increment is always added after the move. But unlike Fischer, not always the maximum increment is added. If a player expends more than the specified increment, then the entire increment is added to the player's clock. But if a player has moved faster than the time increment, only the exact amount of time expended by the player is added. For example, if the delay is five seconds, the player has ten seconds left in their clock before their turn and during their turn they spend three seconds, after they press the clock button to indicate the end of their turn, their clock increases by only three seconds (not five). This ensures that the time left on the clock can never increase, even if a player makes fast moves. Simple delay = when it becomes a player's turn to move, the clock waits for the delay period before starting to subtract from the player's remaining time. For example, if the delay is five seconds, the clock waits for five seconds before counting down. The time is not accumulated. If the player moves within the delay period, no time is subtracted from their remaining time. This time control is similar to a Bronstein with time added before the move. The September 2016 (70th Anniversary) issue of Chess Life contains an excellent article on chess clocks wherein it is mentioned that both Saitek Mephisto & Scholastic Blue clocks are no longer in production. Reminder: Your digital electronic chess clock doesn't like the cold either! "In surface-mount designs, the differential temperature coefficient of expansion between the parts-soldered-to-the-circuit-board and the circuit board can cause large stresses. The stress-strain-temperature relationship often barely works over the specified temperature range. When the equipment is powered up, the hot components can change shape and break the brittle plastic, much like my old ice chest." "If the equipment is below zero degrees C [32 degrees F] and then you take it into a nice warm, humid office, water will condense on the circuit boards and can cause problems. Presumably a similar thing can happen with frost, depending on the weather. When the frost melts, there can be problems." Most electronic chess clocks are difficult &/or expensive to repair, so don't leave your clock in your car overnight! The Chronos (a.k.a. Chronos II, or Chronos Standard) is considered by many to be the best digital chess clock ever made. They are reliable, rugged & extremely flexible for programming functions. However, in addition to being somewhat confusing to program initially, they are a bit pricey & they have a history of being only internittently available even through major distributors. Chronos Clocks come in either a black, blue or beige metal case. The Chronos clocks have 68 preset modes from which to choose. Each of these presets can be customized & saved into one of twelve user selectable presets. This may seem overwhelming at first, but in fact you'll find the vast majority of users rarely use more than four or five presets, & once these are set up, operation is simple & minor modifications are easy. You can watch a six minute video on YouTube explaining how to set up a few typical user programs for your Chronos clock here: YouTube Video, "How to set the Chronos Chess Clock II". This will get you started & after you've set up a few presets for your favorite time controls, you'll most likely rarely if ever have to do any programming beyond occasionally changing a delay or beeper setting, which is really easy to do. instructions on how to set your Chronos clock for 40/90 SD30 inc30 for FIDE tournaments are presented here. The Chronos GX, or "Blitz" Model is almost identical to the Chronos Standard Clock except that the Blitz version has a shorter case & a smaller display which does not show the move counter. Both types of Chronos Clocks may have either buttons or touch sensitive pads for clock operation. The Chronos Blitz Clocks come in a variety of colors including black, beige, blue, & yellow. If you are somewhat put off by the explanations offered in the abridged manual for the Chronos Model GX, you're not alone. However, I find the Blitz/GX model is actually easier to program than the standard model primarily because both the delay & increment settings are available in all of the "tournament" settings, so if you are using either delay or increment, but not both, yoou can just set the unused parameter to zero. Take your pick, or watch both & you'll soon be a Chronos GX Xepert! The Saitek Game Clock II has a row of buttons that allow direct easy access to all functions. Saitek: "Game Clock II" is an older moder, but may be nearly identical in function to the "Competition Game Clock (Scholastic Blue)", "Competition Pro Game Clock (Silver)", & "Competition Pro Game Clock III", which all appear to be different names for the same clock. The Saitek Competition game clock has illuminated buttons that glow green when it's your move & flash red when time has expired. Saitek: "Game Clock II", "Competition Game Clock (Scholastic Blue)", "Competition Pro Game Clock (Silver)", & "Competition Pro Game Clock III" all appear to be different names for the same clock. 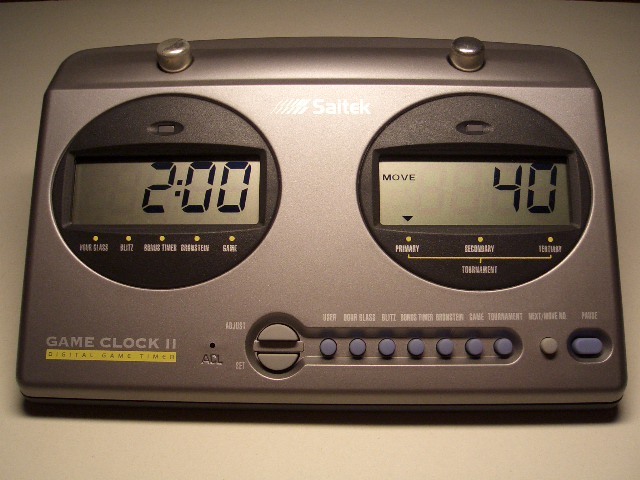 The Saitek Mephisto Competition Game Clock Pro (I believe this is the same clock as the Saitek "Competition Pro Game Clock [III or Silver]" mentioned above.) has illuminated buttons that glow green when it's your move & flash red when time has expired. They are visible from all directions. Modes include: Hourglass, Blitz, & FIDE/ECU/Traditional Tournament as well as Fischer, Bronstein, Delay and Word Modes. ZmartFun Electronics, Inc. are the proud USA producers of these elegant but simple game timers. They are currently available in black, blue, red, & green with bright white, blue, red, & green LED displays respectively. Like many more expensive clocks, they can be easily set for delay, increment, hour-glass, and byo-yomi timing modes as needed. ZmartFun Electronics, Inc. are the proud USA producers of these elegant but simple game timers. They are currently available in black, blue, & silver with large LCD displays. Like many more expensive clocks, they can be easily set for delay, increment, hour-glass, and byo-yomi timing modes as needed. Note: As of May 15, 2018, there seems to be no user manual for the ZMF-Pro Metal case style clock. The newest manual available from Zmart Fun is v2.1 dated 09-07-15. 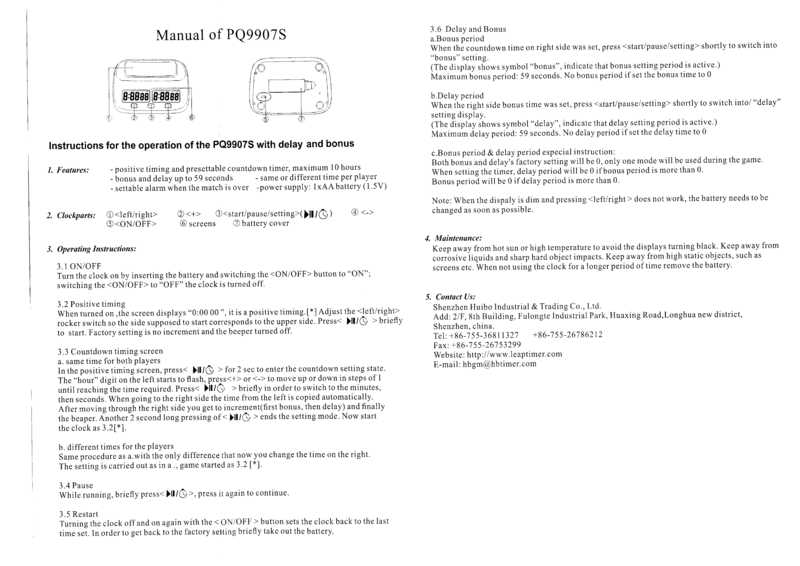 It appears to be an updated version of the older ZMF II manual v1.4 dated 04-18-13. Until Zmart Fun issues a manual that explicitly addresses the newer ZMF-Pro Metal Case LCD style clocks, I'll assume the operation of these clocks is the same as the newer ZMF II style clocks (i.e. v2.1). This is the recently released North American version of the DGT Timer. Like the FIDE version, it may be used in conjunction with a DGT Recording Electronic Chess Board. LCD Display, Two AA Batteries, ABS Plastic Case, 34 Operating Modes. The LCD Contrast is adjustable to accommodate different lighting conditions. This clock does store your personal settings, but in order to start a new game, it seems you must turn the clock off then back on & scroll through the presets to find your desired mode. The main difference between the DGT2010 and the DGT North American (DGT NA) is the way the delay time is displayed and the color of the cabinet. The DGT2010 adds the remaining delay time back for the player's next turn, while the DGT NA pauses during the delay time, which is common in North American countries. The result is exactly the same, only the way of displaying is different. 6.2. b. The time saved by a player during one period is added to his time available for the next period, except in the 'time delay' mode. The DGT NA has less presets for different timing methods and it has no special Go and Scrabble timing methods. The DGT North American is not FIDE approved but all options that the DGT NA has in common with the DGT2010 are according to FIDE rules and regulations. 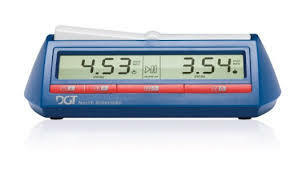 The DGT Timer is the official chess clock of FIDE & may be used in conjunction with a DGT Recording Electronic Chess Board. LCD Display, Two AA Batteries, ABS Plastic Case, 34 Operating Modes. The LCD Contrast is adjustable to accommodate different lighting conditions. This clock does store your personal settings, but in order to start a new game, it seems you must turn the clock off then back on & scroll through the presets to find your desired mode. A special DGT2010 Limited Edition is released in January 2013 to celebrate DGT's 20 year anniversary. It was produced in 2013 only. The Limited Edition has the same options as the popular DGT2010 but is designed in a celebratory red colour. The DGT 960 Timer is specifically designed to support not only typical chess & other game tournaments, but also the "fischer Random" or "Chess 960" variant which requires shuffling the pieces to generate the initial starting position. LCD Display, similar to the Standard DGT Clock above, features adjustable contrast for varying lighting conditions. The DGT 960 is far too tiny for anything like Size C or even AA batteries, so comes with a pre-installed small 3v CR2032 battery that will supposedly last for four years with average use of the sound signal. manufactured in The Netherlands, this clock is an excellent choice for someone wanting to travel light or play lots of Chess 960. This Clock does not have Time Delay and is not recommended for US Chess Federation Rated Play. Made in Guangdong, China. 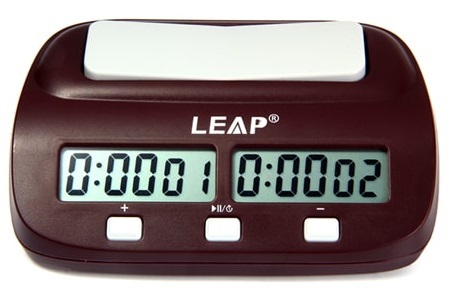 I've only seen a few of these Leap clocks, & they look like an inexpensive version of the DGT to me except they have no provision for connection to an external electronic chess board & they appear to be available in only one color. Actual dimensions are 13.5cm x 9.5cm x 4.5cm & the weight is 135g. They come with a user manual, but I haven't found one online yet. "The Leap PQ9903B clock has the necessary features to provide the 5-sec delay that the WCC uses [as do many other rated tournaments]. The less expensive PQ9907, which has only three buttons below the display, does NOT have the delay capability." Made in Guangdong, China. 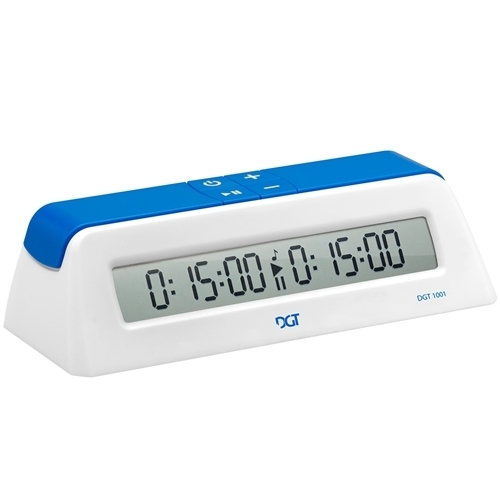 I've only seen a few of these Leap clocks, & they look like an inexpensive (~$15-$20 US) version of the DGT to me except they have no provision for connection to an external electronic chess board & they appear to be available in only one color. Actual dimensions are 13.5cm x 9.5cm x 4.5cm & the weight is 135g. They come with a user manual, but I haven't found one online yet. "The Leap PQ9907S is a slightly newer version of the 9907 you have on the list. The biggest difference is that it (PQ9907S) supports both Fischer time and simple delay mode. It can not do both bonus and delay settings at the same time though. From the low end spectrum, I consider it much more useful than the entrance-level DGT models as it (PQ9907S) has full time control. We tend to play children tournaments with 2 minute penalties for the first two illegal moves and that's downright impossible with the 'DGT Easy' and somewhat annoying with the 'DGT 1001'." Made in Guangdong, China. I've never seen either one of these Leap clocks, [UPDATE: I've seen numerous specimens of both types of Leap clocks.] but they look like an inexpensive version of the DGT to me except they have no provision for connection to an external electronic chess board & they appear to be available in only one color. 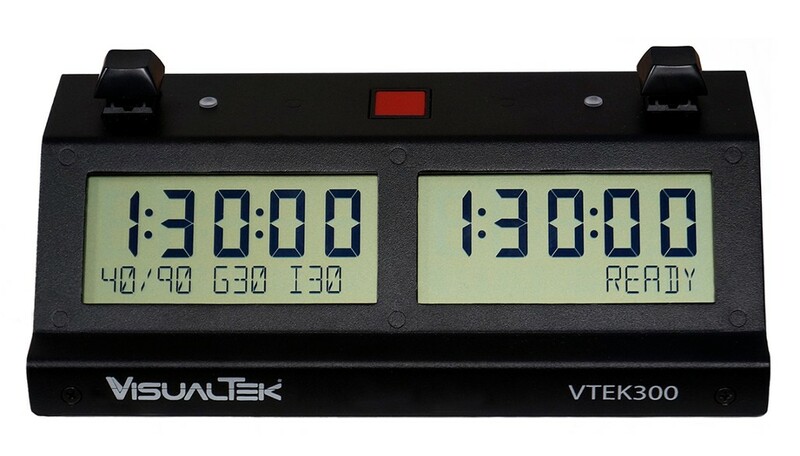 "The VTEK 300 clock is the ultimate chess game clock. The large, clear display shows all the information chess players expect during play and while adjusting settings. Setting is very intuitive and you'll feel comfortable with it in less than 10 minutes. It is designed and made in USA by experienced engineers, advised by chess players who know what a clock needs. For those familiar with the Chronos Chess Clock, we find that this clock beats the Chronos in almost every aspect of design. The battery life is exceptional, options are thorough and well organized. It even has multi-function lights. It's everything a player needs and then some, but without the perplexing programming. It's just easier. 850 hours of game play is estimated on 3 AA batteries. When in idle mode they should last more than 2 years. When about 12 hours of game play are remaining, a low battery warning will show. There is an easy to access battery compartment with two Philips screws. Of course, it is recommended to remove the batteries if not being used for more than a year."